Jenner’s Run occasionally has litters of Labrador Retriever puppies and young dogs for sale. These dogs are carefully bred from working parents with OFA and CERF clearances, as well as EIC and CNM clearances. 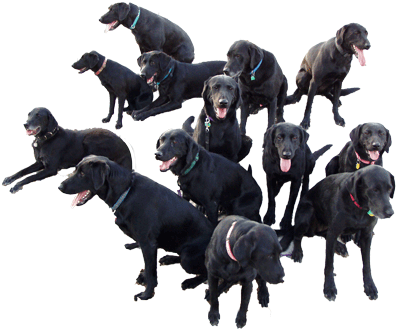 Our goal is to produce dogs that will achieve excellence in SAR and/or hunting retrieving. Our puppies are raised from day one to become your ultimate partner and companion, no matter what your discipline may be. Young dogs experience basic training in obedience, agility, direction and control, and retrieving, and all of them are acclimatized to multiple distractions. All of our dogs live in the home, and that is the environment that we require from future owners. Many of our dogs are successful in multiple disciplines. Our foundation sire, SAR partner, and Jenner’s Run namesake, Jenner by the Sea, was a certified wilderness and FEMA disaster dog, a Park Ranger Service Dog, and a Canine Good Citizen. Jenner achieved the basic hunting retriever title (UKC) and was working on his HR title in his old age. His line continues to be extremely successful in FEMA disaster and wilderness search and rescue work, as well as in the hunting retriever world. Jenner’s offspring include many dogs that have been successful in achieving FEMA and SAR titles, and several hold additional titles in hunting retrieving. We breed this successful SAR line to strong Labrador bloodlines that show the highest level of achievement in the hunting retriever world.